For other people named Richard Roberts, see Richard Roberts (disambiguation). Richard Lee Roberts (born November 12, 1948) is chairman and chief executive officer of the Oral Roberts Evangelistic Association and previously served as president of Oral Roberts University (ORU) for 15 years. Richard Lee Roberts was born on November 12, 1948, in Tulsa, Oklahoma, the son of evangelist Granville Oral Roberts (died 2009) and school teacher Evelyn Lutman Roberts (died 2005). The third born of four Roberts children, he had an older sister, Rebecca Ann, who along with her husband, Marshall Nash, was killed in a plane crash in 1977, and an older brother, Ronald David, who died in 1982 in what was determined to be suicide. Robert's younger sister, Roberta Jean Potts, is a practicing attorney in Tulsa, Oklahoma. As a young boy, Roberts watched his father travel the United States and the world conducting healing meetings where he would preach and pray for the sick. At times, his father and mother were gone for periods as long as six weeks. When school permitted, Roberts accompanied his father on trips and dreamed of having a healing ministry of his own; many times walking by his side as his father prayed for people in the "invalid tent". During the portions of the services where people were getting prayed for, Roberts was often standing on his chair clapping when people were healed. At a young age, Roberts’s music talent was evident to those around him. At the age of 5 he had his first public performance at an Oral Roberts crusade in Baltimore, Maryland, standing on a chair in front of several thousand people singing "I Believe." Also at an early age, his father began to teach him the game of golf. With his first swing of the club, while in their front yard, he sent a ball right through the living room window of their home. In his book, Expect A Miracle My Life and Ministry by Oral Roberts, Oral talks about the bond they gained through the game of golf. Roberts eventually became an excellent golfer and played with notable celebrities. Though drawn to ministry, Roberts was made uncomfortable by all the attention his father received. He was often teased by classmates and even teachers, and even got into fights about his father. "I came home from school many a day with my shirt torn and my nose bloodied from being in fights with the other kids who made fun of me, my dad and the healing ministry of Jesus Christ." As a teenager, with the negative press his father was receiving and pressure from his father to sing at crusades, he began to pull away from involvement with his father’s ministry and began pursuing other talents and interests, such as singing. As a teenager he learned to play the guitar and began singing in pizza parlors and eventually nightclubs around the state of Oklahoma. There was a new dream in his heart, to become a nightclub singer in Las Vegas. In 1966, during Roberts’ senior year in high school he played the lead in his high school play The Sound of Music. He then was offered a music scholarship for the summer to the Interlochen Center for the Arts in Traverse City, Michigan, by the founder Joseph Maddy, when Maddy brought a performing group to the Oral Roberts University campus. According to Roberts’ autobiography, he landed the male lead in the campus production of "Annie Get Your Gun. Graduating from Memorial High School in May of 1966 Roberts was accepted to three different universities and chose the University of Kansas to attend college due to its well-known music program and it being the farthest distance from Tulsa. During the summer of his freshman year he worked at the famous 8,000 seat, outdoor Starlight Theater in Kansas City, with a number of performers including Shirley Jones. He also had been working in a number of night clubs and had been offered a contract to sing in Las Vegas. While at the University of Kansas, Roberts gets sick and had to go to the hospital, possibly needing surgery. The surgery was avoided but soon after returning from the hospital, while alone in his room, he heard a voice, coming out of nowhere, telling him he is in the wrong place. "Where am I supposed to be?, he asks. The voice says, Oral Roberts University. In the Fall 1967, Roberts dropped out of the University of Kansas and enrolled in Oral Roberts University. In 1968 at the age of 19, two weeks before his birthday, Roberts dedicates his life to Jesus Christ and he joined his father’s ministry as a singer on television and in crusades. Roberts received his bachelor’s degree in communication arts from Oral Roberts University in 1985. He received his master’s degree from the Oral Roberts University School of Theology and Missions in 1992 as well as his Doctor of Ministry degree in 2002 from Oral Roberts University. Against the wishes of his family and friends, Roberts married Patricia "Patti" Holcombe on November 27, 1968. In his book, He’s The God of a Second Chance, Roberts’ states, "I was young and thought that I had all the answers to life. Of course, I didn't. I soon discovered that I had made a terrible mistake that I didn't know how to get out of. I did not believe in divorce. So I decided to make my marriage work." Together they have two children, Christi born in 1971 and Juli born in 1972. In 1978 Patti filed for divorce. In 1983, she released a book called Ashes to Gold, discussing her thoughts on Roberts' ministry and university. With his divorce hitting 300 newspapers nationwide and his position in the ministry, Roberts believed it was important to go before the executive staff of the ministry and the university to discuss his desire to remarry and seek their approval. They approved his request. Several weeks later, on January 11, 1980, Roberts married Linda Ann Salem at the campus chapel of Rollins College in Winter Park, Florida. Together Richard and Lindsay had four children. After several miscarriages, their first child, Richard Oral, was born on January 17, 1984. Within hours, complications developed and he died 36 hours after birth. Jordan was born in 1985. Olivia was born in 1987. Chloe was born in 1989. Roberts has 3 grandchildren. At 19, Roberts joined his father’s ministry and became immediately involved in several areas of the ministry including radio, television and traveling with his father on domestic and international crusades. His first trip was in December of the same year to Haiti singing with the music team, Oral Roberts Collegians. His first area of responsibility was reorganizing and developing the Collegians music group into the World Action Singers. Roberts and this group would be featured in the new Sunday morning television program, taped in Los Angeles and prime-time television specials that were taped in different locations around the world. Over the next decade Roberts sings on the television programs and produces more than 15 record albums. When not involved in television production Roberts travels the US and around the world performing in concerts and speaking at ministry sponsored events, as the ministry continues to raise funds to complete the building of the University. 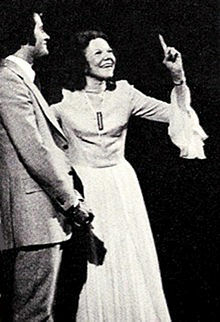 In addition, Roberts travels and sings in numerous healing meetings with Kathryn Kuhlman from 1973-1975.Kathryn Kuhlman from 1973-1975. Roberts’ world falls apart after his wife (Patti) files for divorce. In the book Expect a Miracle, Oral Roberts remembers his son coming to his office devastated, explaining what had just happened, asking what was to become of him and his work in the ministry. Oral notes that numerous individuals, including close friends and ministers, advised Oral to remove Richard from the Ministry, send him overseas for a number of years and even disown him. After prayer, Oral believed that God was not through with Richard and he was still to be involved in the ministry. Roberts remarries and continues traveling doing concerts and singing on television. The concerts transform into a combination of music, preaching and ministry events where Roberts is praying for people and people are testifying they have been healed. In 1982, Roberts holds the first of many international crusades starting with South Africa. According to the ministry website, oralroberts.com, Roberts has ministered in over 40 countries on six different continents including: Russia, India, Brazil, Australia, Niger, and Indonesia. Roberts continues holding domestic meetings and ministering on television programs. In 1984, Roberts begins a live daily one-hour program called Richard Roberts Live that combines ministry, music and special guests such as Richard Kiel, known for his role as Jaws in the James Bond movies and Donna Douglas, best known as Elly May Clampett in the television show The Beverly Hillbillies. In 1985, Oral Roberts steps down and Richard Roberts is elected president of Oral Roberts Evangelistic Association (OREA) by its Board of Directors. In 1986, Roberts works with his father and helps found the International Charismatic Bible Ministries to support independent churches and ministries and to help expand opportunities for student recruitment for ORU. In 1987, Roberts is elected as the executive vice president of Oral Roberts University and is involved in all areas of administration and presides over the ORU chapel services. During the same time period, Roberts continues daily television, domestic crusades with his father, his own international crusades and speaking at churches and conferences across the country. In 1992, Oral Roberts announces to the Board that he will be stepping down as President of ORU. Roberts pushes his team to increase enrollment, tighten budgets and find additional revenue streams. At the same time, Roberts uses his ministry television program to promote the University, increase enrollment and raise funds for student scholarships. He starts the Adopt A Student scholarship campaign as one of these efforts. In addition, he promotes special projects on the ministry's television program to help pay for needed university renovations. Over the next four years, enrollment increases by 1,200 students and the debt is reduced by 50 percent  Roberts used his Ministry connections to help with recruitment, specifically in the African American community. Through his speaking at churches and conferences, he was mainly responsible for the 20% African American student body. ORU receives the Racial Harmony Award from the Council for Christian Colleges and Universities in 2002. Roberts recognizes the importance of the Athletic Program for national prominence and student recruitment. In 1993, Roberts makes a number of changes in the athletic program hiring Bill Self as head basketball coach. Roberts changes the school mascot from the Titans to The Golden Eagles and  hires Mike Carter as the new Director of Athletics. As president of the university, Roberts began incorporating the university and students as part of the crusade/healing rally team. Students and staff from the School of Nursing and staff from the School of Business join doctors as a part of the crusade team. Roberts has outreaches in Ivory Coast, Nigeria, Ghana and Niger that include seminars and surgeries. Tulsa City Council presents ORU president Richard Roberts with a Key to the City of Tulsa to reflect their "eternal gratitude for your efforts on our behalf." A proclamation was read regarding ORU’s contribution to the Tulsa community. In one semester, ORU students gave a total of 2,500 hours of their time in service to organizations in Tulsa. Roberts pushes to increase participation in the Oral Roberts University Educational Fellowship organization to expand the base of Christian elementary and secondary schools involvement to help bolster enrollment. He also focuses on international affiliation agreements. Students could attend classes as at various locations, acquire credit hours and potentially receive an accredited degree from ORU. During his tenure, agreements were signed with schools in Sweden, England, Korea, Singapore, Rhema Bible Training Center in Broken Arrow, OK, and Christ for the Nations in Dallas, Texas. In October 2007, three former professors filed a lawsuit against Oral Roberts University and named the entire ORU Board of Regents, Oral Roberts Evangelistic Association, Roberts, his wife and several university administrators as co-defendants. As a part of the suit, additional allegations were made including: university resources were illegally used by Roberts to help a Mayoral candidate’s election campaign, Roberts misappropriated university funds for a daughter’s trip to the Bahamas, was maintaining a stable of horses at university expense for the exclusive use of his children, used university staff to do his daughters' homework, remodel the university-owned residence that Roberts lived in, 11 times in 14 years, allowed the university to be billed for damage to a university-owned golf cart inflicted by his children and personally acquired two vehicles, a Mercedes and a Lexus, through ministry donors. Roberts responded by saying, "This lawsuit ...is about intimidation, blackmail and extortion." A few days later, the suit was amended, alleging the university’s financial comptroller had been fired; additionally amended stating "Witnesses have reported voluminous materials and documents were shredded and destroyed, constituting spoliation of evidence." One month later another wrongful termination lawsuit was filed against the university by a former ORU accountant, Trent Huddleston, that was employed for less than one year, claiming he had been ordered to help Roberts and his wife "cook the books" by misclassifying over $120,000 in funds, allegedly spent by the university on remodeling the university home that Roberts lived in. On October 17, 2007 Roberts asked for and was granted an indefinite leave of absence from the school by the university's board of regents, citing the "toll" the lawsuit and attendant allegations have taken on him and his family. In a statement Roberts said, "I don't know how long this leave of absence will last... I pray and believe that in God's timing, and when the Board feels that it is appropriate, I will be back at my post as President." Billy Joe Daugherty of Victory Christian Center was named executive regent of the board of regents and interim president. Chairman of the board of regents George Pearsons noted the temporary resignation was not an admission of guilt. On November 13, the tenured faculty of Oral Roberts University approved a nonbinding vote of no confidence in Roberts. The vote was nearly unanimous according to a professor in attendance. Roberts tendered his resignation to the university's board of regents on November 23, 2007, effective immediately. In an emailed statement he said, "I love ORU with all my heart. I love the students, faculty, staff and administration and I want to see God's best for all of them." On January 14, 2008, the ORU Board of Regents voted unanimously to name Richard Roberts president emeritus in honor of his work during 15 years as president. The Huddleston lawsuit was dismissed, with ORU claiming he was nothing more than a disgruntled employee. Huddleston’s attorney stated there would be an appeal, but this never came to pass. In a written statement, the university denied "purposely or improperly" destroying documents. Upon review, it was discovered that the shredded documents had nothing to do with any allegations and were a part of normal policy, required by law for the privacy and protection of students and ministry donors. By October 2008, the original three cases for wrongful discharge had been dismissed or settled. No evidence regarding the additional allegations made against Roberts or the university was produced. No charges were filed and all other lawsuits were dismissed. After stepping down as ORU President, Roberts focuses on what he calls his "first love", the healing ministry. Within weeks of being elected President Emeritus, Roberts conducts a crusade in El Salvador. Roberts is asked to relocate the ministry and Roberts moves the ministry to a new location a few miles from ORU on Skelly Drive. On January 24, 2012, the birthday of his deceased father, Roberts was stopped in Tulsa, Oklahoma on U.S. Route 169 going 93 mph in a 65-mph zone in his Mercedes S430. After failing two field sobriety tests, he was arrested on suspicion of driving under the influence and for driving more than 15 miles per hour over the speed limit. He agreed to take a breath test, which measured his blood alcohol content at .11, above the legal limit of .08. On January 30, 2012 Roberts was charged with two misdemeanor counts, including driving under the influence of alcohol. At a May 2012 hearing, Roberts pled guilty to a charge of driving under the influence of alcohol, speeding, receiving 18-months of probation and paying $1,532 in fees, assessments and court costs. He was also ordered to complete 56 hours of community service, undergo a drug and alcohol assessment, and attend DUI classes. Roberts’ nightly television program, currently called The Place for Miracles, continues, reporting over 125,000 testimonies received. Roberts has additional crusades, medical outreaches in Honduras, Guatemala, Kenya and Ghana. In addition Roberts, in association with his daughter Jordan, begins sponsoring the construction of a Christian school in Niger, sending multiple containers with millions of meals to a number of countries in Central America, Haiti, East and West Africa and working with Pete Sumrall of Feed the Hungry, assist with relief efforts after the devastating cyclone that hits the Philippines in 2013. In 2010 Roberts began the School of the Spirit, currently called The School of Miracles. A free online school featuring the hallmark teachings of the Roberts family with over 25,000 registered students in over 70 nations around the world. Roberts also serves on the Board of Dr. Youngi Cho’s Church Growth International in Seoul, Korea. ^ "Oral Roberts Evangelistic Association 990". GuideStar. 2013. Retrieved 2015-04-15. ^ a b c d e f g h i Oral Roberts (1 August 1998). Expect a Miracle: My Life and Ministry. Thomas Nelson Incorporated. ISBN 978-0-7852-7465-0. ^ "Claim Your Inheritance by Richard Roberts, 2002, The Oral Roberts Evangelistic Association, pages 19-20,"
^ "You Can Touch Heaven With Your Faith by Richard Roberts, 1991, The Oral Roberts Evangelistic Association, page 23,"
^ a b c d e f g h i Roberts, Richard (1985). He's the God of a Second Chance!. R. Roberts. ^ "Faith to Try Again by Richard Roberts, 1997, Albury Publishing, page 13"
^ "Claim Your Inheritance by Richard Roberts, 2002, The Oral Roberts Evangelistic Association, pages 14,"
^ "Tulsa People Magazine, Volume XI, Number 77, May 1998, page 19"
^ "Claim Your Inheritance by Richard Roberts, 2002, The Oral Roberts Evangelistic Association, page 15,"
^ "Starlight Theatre - Google+". plus.google.com. ^ "Claim Your Inheritance by Richard Roberts, 2002, The Oral Roberts Evangelistic Association, page 21,"
^ " "Archived copy". Archived from the original on 2015-05-01. Retrieved 2015-04-24. CS1 maint: Archived copy as title (link)"
^ "Faith to Try Again by Richard Roberts, 1997, Albury Publishing, page 35"
^ Oral Roberts University Alumni Directory, 1998, p. 313. ^ "Roberts Passes Helm to Son", The Bulletin[which? ], January 28, 1993. ^ He’s The God of a Second Chance, p. 30. ^ "He’s The God of a Second Chance, page 31"
^ a b Gardener, Martin (August 13, 1987). "Giving God a Hand". New York Review of Books. Retrieved 2007-10-18. ^ Dewey, Pamela (2013-02-01). Field Guide to the Wild World of Religion: 2011 Edition. eBookIt.com. ISBN 9781456607227. ^ "Expect a Miracle-My Life and Ministry by Oral Roberts, page 228"
^ "He’s The God of a Second Chance, page 54"
^ "36 Hours with an Angle by Lindsay Roberts, 1990"
^ "Miracle of ORU, Abundant Life Magazine, January 1972"
^ "A Tribute to Kathryn Kuhlman, Abundant Life Magazine, May 1976"
^ "We are moving the earth again at ORU, November 1970"
^ "Richard Roberts...His Ministry and His Message!, Abundant Life Magazine, April 1983"
^ "Abundant Live Magazine, October 1984"
^ "Abundant Life Magazine, December, 1985"
^ "Abundant Life Magazine, October Issue, 1987"
^ "Claim Your Inheritance, Richard Roberts, Oral Roberts Evangelistic Association, 2002, page 62"
^ "The Joy of the Lord, by Richard Roberts, Oral Roberts Evangelistic Association, 1995, page 15"
^ "Claim Your Inheritance, Richard Roberts, Oral Roberts Evangelistic Association, 2002, page 64"
^ "The Joy of the Lord, by Richard Roberts, Oral Roberts Evangelistic Association, 1995, page 61"
^ "The Joy of the Lord, by Richard Roberts, Oral Roberts Evangelistic Association, 1995, page 65"
^ "Miracles Now, Oral Roberts Evangelistic Association Vol.2. No. 5 Sept.?Oct. 1998"
^ "Excellence Magazine, Oral Roberts University, Winter 1995, page 5"
^ "Excellence Magazine, Oral Roberts University, Fall 2002"
^ "Excellence Magazine, Oral Roberts University, Summer 1997"
^ "Excellence Magazine, Oral Roberts University, Winter 1995"
^ "New Face in Niger, Tulsa World, Saturday, February 17, 2007"
^ "Healing the body and soul – ORU takes Gospel and medical skills to Africa, Tulsa World, Saturday, February 18, 2006"
^ "ORU President gets Key to the City, Make Your Day Count Magazine, Winter 2006"
^ Risseghem, Jonathan Van. "New ORU Educational Fellowship Contact Information -- ORU". ^ "Excellence Magazine, Oral Roberts University, Summer 1997, What's Happening at ORU, Summer 1997"
^ a b c "OCIS Case Summary for CJ-2007-6543- SWAILS, DR JOHN v. ORAL ROBERTS UNIVERSITY (Tulsa County District Court):". The Oklahoma State Courts Network. Retrieved 2010-10-01. ^ "3 Former Professors Sue Oral Roberts U." The Chronicle of Higher Education. October 4, 2007. Archived from the original on October 12, 2007. Retrieved 2007-09-24. ^ Tulsa World (October 2007). "Swails, Brooker, Brooker v. Oral Roberts University, et al" (PDF). United States District Court for the Northern District of Oklahoma. Retrieved 2007-09-24. ^ a b "Oral Roberts president faces corruption lawsuit". MSNBC. October 5, 2007. Retrieved 2007-09-24. ^ a b "Online copy of revised Swails lawsuit against ORU, October 12, 2007" (PDF). ^ a b Blumenthal, Ralph (2007-11-18). "President of Oral Roberts to Take Leave of Absence". The New York Times. Retrieved 2007-11-17. ^ a b Marciszewski, April (2007-10-18). "Roberts takes ORU leave". Tulsa World. Retrieved 2007-10-18. ^ "Faculty Opposes Oral Roberts President". Associated Press. The New York Times. 2007-11-14. Retrieved 2007-11-16. ^ Marciszewski, April (2007-11-15). "ORU faculty gives vote of no confidence". Tulsa World. Retrieved 2007-11-16. ^ Marciszewski, April (2008-01-15). "$62 million for ORU". Tulsa World. Retrieved 2010-10-01. On Monday, regents voted unanimously to name Richard Roberts president emeritus to honor his work during 15 years as president, Pearsons said. ^ "ORU Spring Revival Service, Christ Chapel, Oral Roberts University February 26, 2003"
^ "Charismatic Life & The Healing Ministry Class lecture transcript, Feb 12, 2004"
^ "KOTV.com |Remembering Tulsa Evangelist Oral Roberts Posted: Dec 15, 2009 2:22 PM CST Updated: Dec 16, 2009 1:30 PM CST"
^ a b "Richard Roberts, ORU's former president, arrested on DUI complaint". Tulsa World. January 25, 2012. Retrieved 2012-06-19. ^ "Oral Roberts' son arrested on suspicion of DUI - CNN.com". CNN. 2012-01-24. ^ "DUI, speeding charges filed against Richard Roberts, former Oral Roberts president". Tulsa World. January 31, 2012. Retrieved 2012-06-19. ^ a b "Richard Roberts gets probation in DUI case; former ORU president pleaded guilty, serves no jail time". Tulsa World. May 2, 2012. Retrieved 2012-06-19. ^ "Richard Roberts School of Miracles". som.oralroberts.com. Wikimedia Commons has media related to Richard Roberts (evangelist).